Lakeview Orchestra will perform Bizet’s Farandole from L’Arlésienne on Tuesday, December 18th at 7:30PM at the Athenaeum Theatre. Farandole is the finale of Georges Bizet’s L'Arlésienne Suite No. 2, composed as incidental music to Alphonse Daudet’s play of the same name (“The Girl from Arles”). The play, a tragicomedy, is set in a small village in southeastern France and focuses on Fréderi, a young peasant who is driven to suicide after discovering the infidelity of his bride to be (L'Arlésienne). The farandole is a celebratory folk dance and is usually led by the most recently married couple – ironic, considering the play’s conclusion. Furthermore, as in Samuel Beckett’s Waiting for Godot, the title character never actually makes an appearance, contributing to the more histrionic aspects of the work. 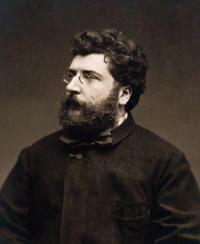 The grand orchestral melody of Farandole was taken from a motif of a popular French Christmas song with origins dating back to the 13th century, known as “March of the Kings.” Bizet’s penchant for rich dramatic orchestration coupled with folk melodies enabled this witty movement to be repurposed as a celebratory work for the yuletide season.